Note; upon the creation of this "how to" childboard I will be editing this thread less, perhaps only adding really really good tutorials/instructions/how to's, if you have a how to, make a new topic for it, if you have creation conundrums do the same! If you have links or tutorials or insctructions on how to do or make steampunk things lets see them here! 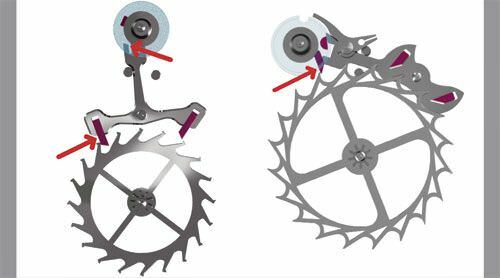 2: Watch: look below the balance and see the escapement, it'll be a small Y or T shaped thingy which moves back and forth when the balance is rotating. Clock: find where the pendulum mount enters the movement, and notice the escapement mounted on it's shaft. 3: Watch: remove balance wheel, a small screwdriver should do the trick, be very careful if you'd like to replace the balance afterwards. 6: wind and delight in whirring and spinning gears. I've found that most of the watched I've done this to will spin for several seconds as you wind the spring. If the hands are still on, they will cycle through several hours in a number of seconds. ~How to produce embossed metal effect on flat surfaces without big machines. A quick way to make a complex embossed finish on an object is to use a pre-woven lace edging of the sort sold in trimmings shops for dressmaking/ upholstery. Glue it down to the surface and metallic paint the hell out of it. The paint soaks into the fabric and makes it look and feel like a punched/ etched bas relief. All sorts of designs are available from simple geometric patterns to complex curly swirly stuff. I've just done the stem of a ceremonial mace like this and it looks dammned fine. 2) use pliers to yank both the bottom and the tip off the marker. 4) Take a 1 Litre bottle, rinse it out, and fill it with water. 5) Toss the foam thingy into the bottle, and shake. The flourescent ink should diffuse out into the water and once it does, the entire bottle should flouresce under a blacklight. 5) Pour it into some neat looking bottles, or do whatever with it. ~How to make flex, a.k.a. cloth covered wire! 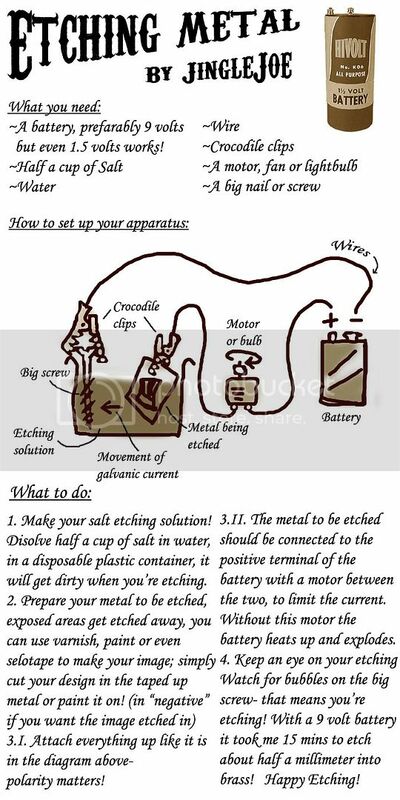 ~How to make the greatest leather goggles ever! ~Making and using gear stencils! And here is a gear generator! ~A Simple way to make a "preserved thing in a jar"
~How to make a large prop sausage for a stage play. Buy two 3l. plastic bottles of industrial strength brain cell killer cider. Wake up next day and take some paracetamol. Cut the bottom off both empty bottles and stick them together end to end. Take the top off one end and fill with expanding foam. Cut the neck off each end and clean up to give a suitable dome shape. Cover bottles with tissue paper and pva glue and leave to dry. Give resulting object a suitably convincing sausage paint job. Mount sausage onto a black painted stick and give to props master for use in amusing dream scene. Make solemn oath never to drink cider again. At least, not till next time. ~How to make a "File File" - an inegnious tool holder! 1) leave the roll of duct tape out in the rain. How to make a large prop sausage for a stage play. p.s. More serious ones to follow. How to produce embossed/repuce metallic effect on flat surfaces.
!) leave the roll of duct tape out in a rainstorm. 4) take a 1l bottle, rinse it out, and fill it with water. 5) toss the foam thinger into the bottle, and shake. the flourescent ink should diffuse out into the water. and once it does, the entire bottle should flouresce under a blacklight. umm that sausage thing isnt very steampunk hahaha but I'll make a new section for it - "not very steampunk"
the rest are great thanks and I hope there many more from everyone! You impune the steamyness of my sausage? You do not realise your peril. Mods - can we make this a sticky? Damned useful thread. Many thanks to all who have contributed thus far! I do! Get over it its a sausage; its not brass, lacks gears, goggles, leather, wood, lacks a top hat, the list goes on; Its just not very steampunk. I can fly anything... Just watch me! The music is reversable, but time...is not. Why not make a tutorial for how to do that? Just bumping to remind people this thread is still here, and still awaiting more tutorials! Come on, that can't be all you got ? Thanks for posting this!! I have an old torch I'd like to convert! Well you pick up the end of your thread, and hold up the needle. Then you try to put the thread through the eye of the needle, usually poking yourself a few times and freying the end of the thread, which you slick back to a point with saliva. Then go back to trying to threat the needle. Till you get fed up, throw the spindle across the room, stab the nearest thing with the needle an go find something to drink. I thought this might happen! Here are some how to links on welding..
F. Arden Maxwell, freelance tinker. Please refer all correspondence care of Pandora Bay Research Center, South Pacific. Expect delays, and possibly slightly charred responses.